Cambridge is a small city, and any visitor would do well to traverse the triangle of main roads which cover the city centre. Starting down at the junction between Trumpington Road, Lensfield Road, Fen Causeway and Trumpington Street, you can easily see or reach the Botanic Gardens, Royal Cambridge Hotel and Engineering Faculty. As you walk up Trumpington Street you soon pass the Fitzwilliam Museum. Described by the Standing Commission on Museums & Galleries in 1968 as "one of the greatest art collections of the nation and a monument of the first importance", this free museum is well worth a visit. A personal favourite is Edward Lear's large painting of the Temple of Apollo at Bassae,. Better known for his poetry, his art is well-worth investigating too. The Fitzwilliam was also the site of an unfortunate and infamous trip downstairs, which resulted in three Chinese vases being smashed, leading to a major conservation project. Whatever your interest, the well-planned museum has plenty to offer, with an excellent café and ongoing educational projects to keep you entertained, refreshed and informed. Continuing up the Road you pass a succession of colleges, including Peterhouse, St Catherine's, Corpus Christi and Pembroke. In addition you pass the University Press, and a number of shops vital to student life, for clothes, food and bikes. You then reach the university church. Rules set a minimum residence requirement: all undergraduate students must spend a minimum number of 56 nights per term within a certain distance of it. The rule helps foster a sense of community among students, supported by the innumerable coffee bars and restaurants (which demand an article of their own). Opposite the church lies King's College. Henry VI wanted to have the largest quad in Cambridge, leading to a truly magnificent Front Court. 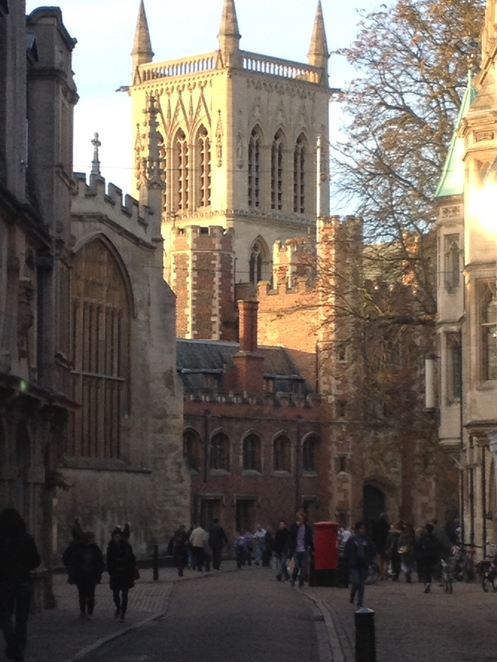 The iconic chapel is open to visitors, and Evensong is sung there regularly. Perhaps the most famous service is the Christmas one, with carols broadcast around the world on the BBC. As you continue up what has now become Trinity Street, you pass Heffers, the university bookshop. Bought by Blackwells, it maintains the name so that you know you're still grounded in Cambridge, and it offers an unparalleled collection of interesting books. Opposite Heffers is Trinity College, another one of the oldest, richest and most beautiful foundations in the city, again open to tourists. The front Great Court is perhaps most famous as the site of the great race in the film 'Chariots of Fire'. Finally, next to Trinity lies St John's, a rival in size and student results. St John's lies on the corners of several roads, and you can turn back to join up with the other main road which would once again loop you down to Lensfield Road, through the commercial shopping heart of the city.